The Spring quarterly release for 2019 is the Field Notes Mile Marker edition. Celebrating America’s Dwight D. Eisenhower System of Interstate and Defense Highways, the edition has bright covers that mimic highway signs. Stamped with reflective foil to reflect like just like the signs they were created after. Each pack comes with 3 different cover designs. Inside the notebooks feature a grey dot grid pattern on Domtar Lynx Opaque Smooth 60#T white paper. Each notebook comes in a 3-1/2" × 5-1/2" size with 3/8" rounded corners. The notebooks are bound with a Heidelberg Stitchmaster ST 270 5-pocket saddle stitcher. Each notebook has been printed and manufactured in the U.S.A. 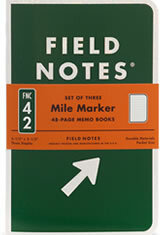 The Field Notes Mile Marker Memo & Notebooks usually ships within 1 business day unless otherwise specified. Each Field Notes Mile Marker Memo & Notebooks we sell is guaranteed to be genuine, authentic and will arrive brand new & unused!